Next Generation Vehicle Diagnostic Systems.The big goal is to reduce costs and provide faster testing. • Automotive Manufacturing Industry or Automotive Workshop / repair shop. • Create a new tablet which is smaller, lighter, and faster than previous generations. • Special interface connections in the tablet. • Special steering wheel mount. • Special desk docking station. • 8.4" Customized Tablet PC with special steering wheel mount and desk docking station. The future is here, and all of our automotive systems are being controlled and monitored by computers. The entire automotive system must be designed to be safety-critical to ensure the safety of the driver, passengers, pedestrians and other vehicles. To improve the quality and reduce errors in these systems, Automotive OEMs and suppliers are requiring good diagnostic tools to detect and discover any failures which appear in automotive systems. Daimler, A leader in car manufacturing and luxurious cutting edge technology, demands the highest standards in their products and was looking to upgrade their Vehicle diagnostic equipment. Winmate’s next generation 8.4” tablet running Windows 7 was the perfect tool for the job; this offers faster testing speeds while also providing a much longer battery life. Daimler required a high performance processor, a lightweight device coupled with a special vehicle docking system that allows staff and technicians to easily remove the device and carry it around the factory or manufacturing line. 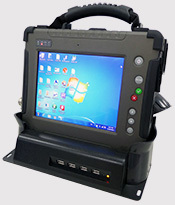 Winmate, a global leader in developing advanced rugged mobile technologies offers an Ultra Rugged Tablet PC that can serve as a Vehicle Diagnostic Tool. 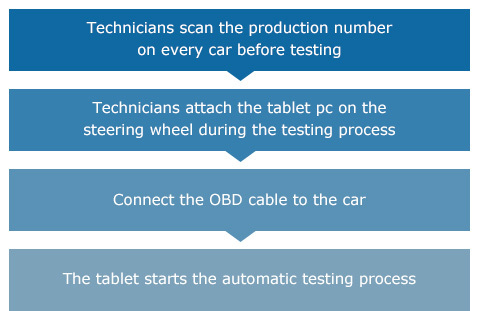 Winmate's 8.4" Tablet PC was used to diagnose the full functionality system of the car (e.g. seat heaters, air condition, air bag, engine and so on).The steering wheel mount is a very important feature, as the technicians need to attach the tablet on the steering wheel while doing the diagnostic tests.Winmate also provides a special desk dock for the tablet to expand the connectivity of it. Intel Atom N2800 1.86GHz with Intel NM10 Chipset. 802.11 a/b/g/n WiFiand Bluetooth 4.0 (Class I) Half miniPCIe Combo Card. Through this special OBD (On Board Diagnostic) connector, car manufacturers are able to discover and identify potential problems in the car. In this Tablet PC, Winmate customized a special OBD connector to allow the tablet to communicate with the required vehicles. Technicians need to hook the Tablet PC onto the steering wheel for an extended period of time which will leave marks on the wheels outer cover. To overcome this problem, Winmate developed a special pillow that is soft and elastic underneath the mount to prevent damage to the steering wheel. The barcode reader is used to scan each cars unique identification sticker; this represents the vehicle's VIN and is used to prevent errors when technicians are testing multiple vehicles at once. Since the tablet pc will be used in both vehicles as well as office environments, a desktop docking station is provided. The desktop dock expands the connectivity of the tablet to (4 x USB, 1 x COM (RS232), 1 x VGA, 1 x 10/100 LAN port). Having quick access to keys that are often used is important for ease of use; these customizable hot keys provide new and faster ways to perform many basic tasks like scanning and quick access to programs. • Winmate is a global leader in developing advanced rugged mobile technologies. • Winmate's existing product (R10ID8M-RTT) is close to Daimler's requirements. • Qualified and cost efficient proposal. • Uncomplicated and Fast design-in on the CAN Bus interface. • Designed to work flawlessly on the steering wheel mount and desktop docking station. • Worldwide 3 Years Comprehensive Warranty with Local Service centers in Asia, Europe and The Americas. • Wordwide buying contract for easy logistics and handling. • Localized Service and repair centers for easy and fast support. • Investment cost have been cut in half compared to previous generations, so more test systems can be purchased. • Faster testing results in better productivity in the factories, this means more cars can be produced, and shorter production lines may be built in the future to save valuable factory space. • Cost reduction and improving efficiency was the ultimate goal to be reached, together this has been achieved. • Win Embedded 7 std.